The Christmas season is all about getting together with family and friends to eat, sing and have a merry time. Every year, families look forward to traditions that make the holiday season feel special. Whether you’re starting a new family, joining an existing one or looking to mix it up this year, get inspired by these 50 family Christmas tradition ideas. Bake Cookies - Bring out the stocking-shaped cookie cutters and red icing to make tasty Christmas treats. When you’re done, package them in cute bags and share with the mail carrier or school principal (or just eat them yourself). Decorate the Tree - Real or faux, big or small, the Christmas tree is one of the most iconic symbols of the season. Make decorating the tree a family tradition by taking out ornaments that remind you of childhood — or that have been in the family for generations. Play “rock, paper, scissors” to see who gets to put the star on top. Go Caroling - Grab your crew and head out into the neighborhood to sing your favorite songs of the season. Be sure to pick a time when people will appreciate your joyous voices — not too late at night or early in the morning. Look at Lights - Find your city’s most twinkly street (go to your neighborhood’s Facebook page to ask for ideas) and take a slow drive to enjoy the lights. Open an Advent Calendar - In the old days, these calendars would contain candy or a small toy for children to enjoy every day of December leading up to Christmas. Today’s Advent calendars can be full of treats, cards or gadgets. Whatever theme you choose, a small treat is a great way to start the day during what can be a hectic season. Put Up a Nativity Scene - Celebrate the reason for the season by putting up a nativity scene. You can display a small one inside or go for something much larger out on the lawn. As you put out each figure, tell the kids who they are and their role in the Christmas story. Cook a Special Dish - There’s nothing like food to evoke a childhood memory of Christmas. Talk to family members to find the recipe for your grandmother’s candied yams or whatever dish reminds you of the holidays, and pass the tradition down to the next generation. Play Christmas Songs on the Radio - This is a simple tradition, but it sets the tone for holiday cheer. Take your festive spirit on the road by changing the radio to a station that only plays Christmas music. Add a twist by making family members do something funny each time a classic comes on (i.e. the first person to touch his nose when Rudolph, the Red Nosed Reindeer plays, “wins”). Make Eggnog - This traditional beverage has many variations. Make it without liquor for everyone to enjoy or try out a fancy new recipe. In a rush? You can also buy pre-made eggnog at your local store. Hang Some Mistletoe - Pick a central location to hang leaves of this pretty plant, which traditionally obliges couples to share a kiss underneath. Watch a Special Movie - Whether you like the Rudolph cartoons or are a sucker for “Christmas Vacation,” watching Christmas movies is a classic part of the season. Do some research to find out when they air and set your DVR accordingly, or watch them online via your favorite streaming service. Genius Tip: Get started with these top 20 Christmas classics. Visit Santa - Take the kids to see the big guy in person at the local mall. Check online first as some places let you make an appointment in advance to avoid the line. Add your own Christmas jammies theme or get decked out in your fanciest attire. Send Christmas Cards - Pick up festive stamps and send some good old-fashioned snail mail. You can make a personalized card online with family photos, or handwrite your holiday greetings in a winter-themed greeting card. Either way, recipients will love hearing from you. Attend a Christmas Eve Service at Church - Dress in your holiday best to attend a Christmas Eve service. 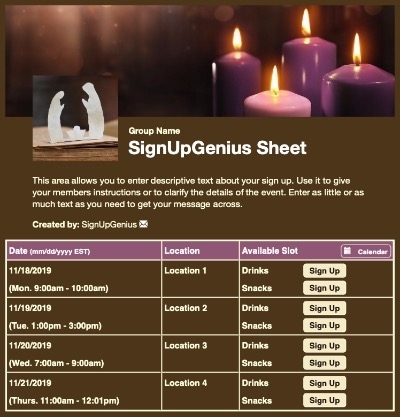 Extend the invitation to co-workers, neighbors or relatives who may also enjoy a message of hope and a candlelit song. Create a Christmas List - You can start this one early in the year when your kids bug you to buy the hot new toy — tell them to write it on their Christmas list. When the holidays approach, help them narrow their list down to a realistic amount. Need a template? Many families go by the adage: something you want, something you need, something to wear, something to read. Go on a Horse and Carriage Ride - Bundle up and live the song “Jingle Bells” in real life with a ride through town in a horse and carriage. Wear Matching Christmas Pajamas - Delight (or embarrass) your children by having everyone in your family wear matching pajamas on Christmas Eve. Post the pictures on social media for maximum parental points. Buy a Poinsettia - These bright red or white flowers bloom near the holidays and are a festive way to brighten up your home. They also make great host or hostess gifts for all the gatherings you attend. Offer Cookies and Milk - Put out a plate of cookies and milk for Santa — and don’t forget carrots for the reindeer! Go all out by mixing oats and glitter together as “reindeer food” and sprinkle a bit of magic on the front lawn. Take Professional Christmas Photos - Plan your Christmas card in advance by hiring a photographer to take Christmas card photos in November (or earlier). You can also put the images on a dated ornament to see how the family has changed over the years. Decorate with DIY Crafts - Whether it’s glitter-sprayed pinecones or popcorn and cranberries strung together, DIY decor can be an inexpensive and fun way to make your home feel festive this holiday season. Make Marshmallow Snowmen - Stick three marshmallows together with white frosting and use mini M&Ms or bits of black licorice for the eyes and mouth. Pretzels make convincing arms and legs and allow your snowman to dangle from the edge of your cup of cocoa. Do a Paper Chain Countdown - Help kids cut 25 strips of red and green construction paper and fashion them into links for a chain. Then let them pull off a ring each day as Christmas approaches. Make a Candy Cane Reindeer Ornament - Twist brown pipe cleaners around the hook part of a candy cane to make “antlers” and finish by gluing on wiggle eyes and a red pom-pom nose for an easy, tasty party favor. Pin the Nose on Rudolph - Put a Yuletide spin on “pin the tail on the donkey” with this fun game that requires players to wear a blindfold, spin around five times and attempt to connect Rudolph’s nose to his face. Give Baked Goods as Gifts - Who needs another candle when you can give something yummy, like a batch of brownies? Have kids help with preparation (or just let them lick the bowl). Consider writing out the ingredients or common allergens for those with dietary restrictions and place in a pretty holiday tin or brown cookie box with twine. Write Thank-you Notes - A handwritten thank-you note is a fantastic way to show gratitude to gift givers. Plan time for this so it doesn’t get lost in the busyness. Bake a Cake for Baby Jesus - Kids love birthday parties, so help them celebrate the ultimate party by baking a cake for the birthday boy. Play “What’s in the Stocking?” - For this game, put items — like a small ball, candy cane or other Christmas goodie — inside a stocking and have guests try to figure out what’s inside based on touch alone. Don’t let them put their hand inside the stocking! Find the Pickle - Hide a small glass pickle ornament inside the tree, and whoever finds it gets to open a present first. Have a Spoon and Ornament Race - A twist on the field day favorite egg-in-a-spoon race, this version has participants put an ornament in a spoon and race to the finish line without dropping it. Up the ante by requiring players to put the spoon handle in their mouths. Make an Edible Bird Seed Ornament - Dip a pinecone in peanut butter, roll it in birdseed and hang it outside as a tasty treat for your feathered friends. Track Time with a Fingerprint Ornament - This cheap and easy gift idea will also allow you to track how much your child has grown over the years. Have kids dip their finger in brown or white paint, and glue on some googly eyes and pipe cleaner antlers to create a mini-reindeer — or use three white fingerprints and black “buttons” for a snowman. Make sure to date the ornaments and put your child’s age so you can enjoy it over time. Build a Gingerbread House - Buy a kit online or bake slabs of gingerbread yourself. Use gumdrops and other candies as decoration. Take it to the next level by holding a friendly decoration competition amongst siblings or cousins. Hand-cut Snowflakes - This quick and easy activity will help kids work on their fine motor skills. Fold a piece of white paper several times and have kids make small cuts in the fold, then open it up to reveal a unique snowflake. Hang them from your ceiling to create a one-of-a-kind winter wonderland. Welcome an Elf on the Shelf - Surging in popularity in recent years, Elf on the Shelf is a clever way to bribe kids into being good during the holidays. According to his lore, he sits on the shelf and watches kids’ behavior, which he reports back to Santa in the North Pole. These elves have been rumored to get into mischievous activities. Genius Tip: Get creative with these 100 Elf on the Shelf ideas. Letters to Santa - You can save the letters and make them into a book for kids to read when they’re older. Track Santa - The big guy got a tech-savvy upgrade when the North American Aerospace Defense Command (NORAD) debuted its online Santa tracker. Visit the website on Christmas Eve to see where in the world St. Nick is, and how many gifts he’s delivered so far. Other sites like Google and Facebook offer Santa trackers as well. Dance Together - Make a Spotify playlist or tune to a Christmas Pandora station for festive tunes. You can even make Spotify playlists collaborative so that the whole family can add songs. The perfect soundtrack for tree-decorating and cookie-baking. Conserve Energy - Replace traditional Christmas lights with brighter, more energy-friendly LED versions. Animate It - Send an email card picturing your face as a dancing elf. Sites like jibjab.com make hilarious animated holiday cards that feature you and your family as elves, snowmen and more. Mobile Carols - Make the ringtone of your phone a Christmas song, or replace your text tone with a jingling bell sound. You never know when or where you might bring a smile to someone’s face! Video Chat - Even if you are far away from loved ones on Christmas day, you can include them in your celebrations via FaceTime, Skype or other video chat apps. Skype grandma on Christmas morning so she can watch the kids open gifts, or sing a carol to your uncle who lives across the country. 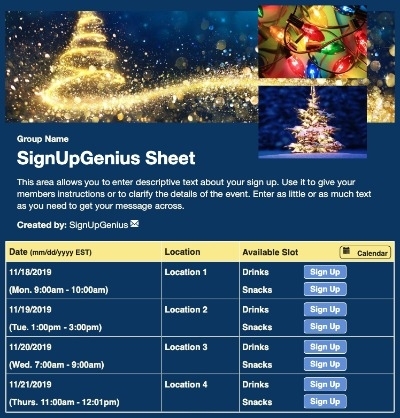 Get in Touch with Santa - Many apps and websites allow kids to call Santa, email, receive texts from him or even video chat with St. Nick himself. Angel Tree Gifts - Many stores will put up “angel trees,” which contain names, ages and Christmas lists from less fortunate children. Pull an angel from the tree and help your kids shop for them. Genius Tip: Organize a holiday Angel Tree with these tips and ideas. Volunteer at a Soup Kitchen - Many nonprofit organizations often need volunteers as temperatures drop and they see a large influx of people during the holidays. Take your kids along to teach them to appreciate what they have and serve others. Skip the Return Line - When your kids get clothes that don’t fit or toys they already have, consider foregoing the return line at the store in favor of donating the gifts to an organization or child in need. Donate Cash to the Salvation Army - Be sure to bring change to give to the bell ringers outside stores this season. Some locations offer credit card options if you forgot your cash. Genius Tip: Learn more about the Salvation Army and how they organize to bring joy to thousands of children on Christmas morning. Walk Dogs at an Animal Shelter - Even our furry friends deserve to see a friendly face during the holidays! Many animal shelters run low on volunteers when people are traveling to see family. Christmas Stories - Many schools and childcare centers would love more volunteers to come to read to the kids. Bring your favorite Christmas book and be sure to act out the funny parts, like Santa’s jolly laugh. Memories and traditions are what make the Christmas season special. In addition to your go-to traditions, try something new this year. 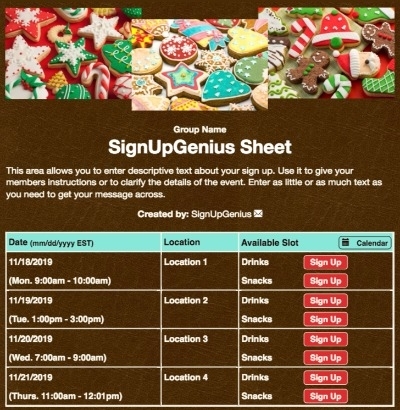 Plan a Christmas party potluck with an online sign up.